I’m not sure if this has to do with the fact that I’m running on a high DPI display and it’s not scaling or if there is another issue. I’ve tried changing the override font in preferences, but that didn’t seem to help. No other apps exhibit this behavior. did you set some custom dpi values or increase the proportion value from 100 to 125 or 150%? Thanks for getting back to me. All of my screens are set to pre-defined values. My 3200x1800 laptop screen is set to 150%, and my external displays (when hooked up) are all set to 100%. 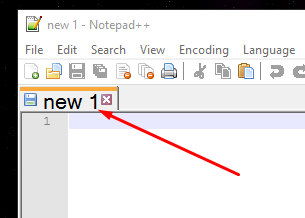 It doesn’t seem to matter whether I’m using notepad++ directly on the laptop or on an external display. My thought was that maybe NPP is grabbing the 150% from the internal screen and not adjusting after the fact, or if there is another display instead. I frequently use my laptop closed and hooked to one or more external monitors. What’s strange is that it seems like only certain text is affected (the “Help” box and the menubar). All other text, including the editor text is fine. I am going to pull the npp source and see if I can find anything, but was hoping that someone might have seen this before. for the general ui behaviour with high dpi displays. I installed a fresh PC, with one screen having 200% scaling, the other one 100% scaling. I reset the scaling to 100%, but nodepad++ still uses a huge font for the tab headings. The screenshot is taken at the screen never having other scaling values than 100%.